Massimo's latest project is dominated by short pieces, many of them written for beautifully fake mallet instruments and real drums. The approach is refreshingly primitive. 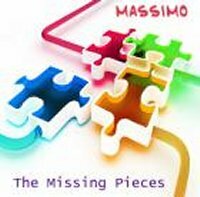 Many words come to mind when attempting to describe "The Missing Pieces": surreal, haunting, mysterious, dream-like and let's not forget... stimulating! Massimo's exploration of the boundaries between art and reality, and for his distortion of every day recurring patterns and experimentation with rhythmic shapes, make for an interesting listening experience. The highly imaginative compositions create a fantastic and indescribable dream-universe all their own, one which must ultimately pay attention to in order to be fully appreciated. It is always good to "listen" when musicians are constantly progressing.